Better late than never. As far as Déjà vu is concerned, last week (our first week on the mountain for the year 2016) between 18 & 25 January reminded us last year’s early January. Low temperatures, high winds and considerable amounts of snow being blown off. Upon arriving on the Plateau of Muses we had a meter of fresh powder outside the refuge soon to be gone under strong winds from the north. Out of one week we had only one calm afternoon. Alpenglow with the Throne of Zeus (Stefani) and the summit of Toumba (right). 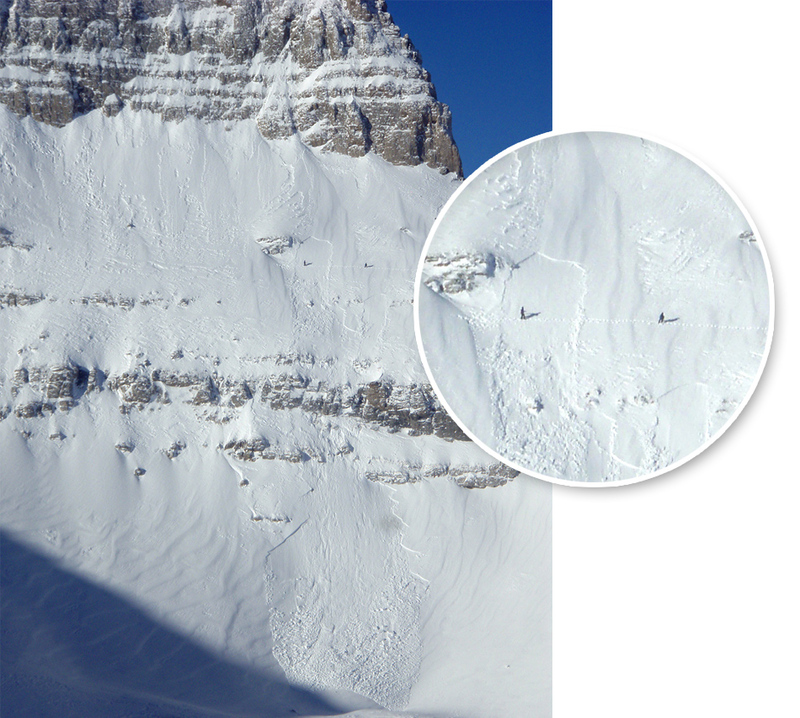 Low temperatures and high winds created wind slab avalanche conditions and in two occasions climbers traversing to Mytikas and under Stefani cut slab avalanches. This incident should remind to everyone about the increased avalanche potential on Mount Olympus and the Greek mountains in general, due to their specific maritime setting and fast changes of the weather. A photo right after the avalanche incident on Sunday January 24th. Having these and many similar incidents in mind, this February the Hellenic Rescue Team (HRT) in cooperation with ANENA (Association Nationale pour l’Étude de la Neige et des Avalanches) organize an avalanche seminar for the first time on Mount Olympus (more info at http://www.hrt.org.gr/seminario-prolipsi-antimetopisi-xionostivadwn.el.aspx). The classic view from the evening ski tour to the summit of Toumba. The north face of Skolio (in front and to the left) with poor climbing conditions, the subsidiary summit of Kitros (behind Skolio to the right) and Pindos range in the far back ground. Forecasted high temperatures and freeze-thaw cycles are the best medicine to keep the snow on the ground and create a good base, in the hope that February will bring more snowfall. With the ultimate hope that the Gods’ thick white blanket is on arrival, we said Adios and left the place in peace until March, a month that traditionally constitutes the peak of the skiing and winter climbing season. A farewell from Skourta. A location where the Ancient Greeks prayed frequently to the deities, and where the some nice ski runs start.